With the onset of winter, many external parasites tend to be less problematic. Flies, ticks and mosquitoes either die or find a hiding place until warmer days. One exception to this rule is the Northern Fowl Mite. This parasite is problematic beginning in December and hangs around during the colder months. The NFM is the most important parasite of poultry in the United States. The external parasite is extremely common in all types of poultry facilities. Since this mite is so common, backyard poultry producers are unlikely to escape this pesky parasite. The NFM has an oval body with long legs and is approximately one mm in length. The color varies from white to red to black depending on if the mite has consumed a meal of blood. The mites are usually found in the vent area. The mites reside on the feathers, but travel to the skin to feed. Following a blood meal, females will lay one to three eggs. The life cycle from egg to adult takes between five to 12 days to complete. The parasite usually spends its entire life on the host. If the mite is dislodged from the host, it may survive for two to three weeks depending on the temperature and humidity of the environment. With a short life cycle, populations may increase rapidly. The densities of this parasite are greatest in the winter. The NFM may be introduced into a poultry facility by a variety of ways. Wild birds and rodents may carry the parasite into the facility. Borrowing equipment from another producer is an additional way of introducing the pest to the facility. Allowing newly purchased birds to enter the flock without going through a period of isolation and treatment is an excellent way for the mite to enter the flock. Clinical signs of NFM infestations vary depending on how many mites are present on the birds. 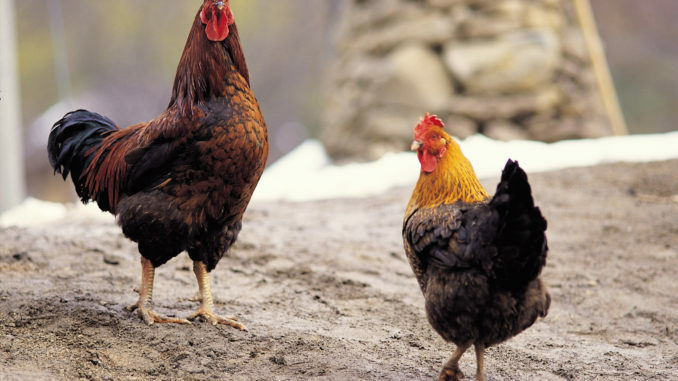 Initially, producers may notice chickens scratching, biting feathers, or rubbing on objects. As the number of mites increase, the chickens become more irritated. The feathers in the vent area look dirty due to becoming soiled with dried blood, excrement, and skin cast. The skin becomes thick and crusty. With large numbers of mites, anemia and death are possible. Because of irritation, chickens infected do not eat well, which results in weight loss and decrease egg production. Producers should be monitoring their birds for infestation on a regular basis. Young birds should be watched closely since the mites prefer them over older birds. Birds should be turned upside down and the vent area examined. A bright light might be needed to examine the animal. Producers should look for dirty feathers and/or red scabby skin. The mites may be seen by parting the feathers and looking for small oval dark objects. When gathering eggs, producers should check to make sure that any small dark spots are not mites. Read more in the January issue of Oklahoma Farm & Ranch magazine.